We love this How Far I’ll Go easy piano arrangement from the hit Disney movie Moana. Download below! The notation is for this arrangement is big, clear and simple to read. Even though some rhythms are a little bit tricky to read, they are only tricky in the right hand part. Your ears can help make it sound just like the song! You can also keep your eye on the lyrics to help you keep track of where you are. 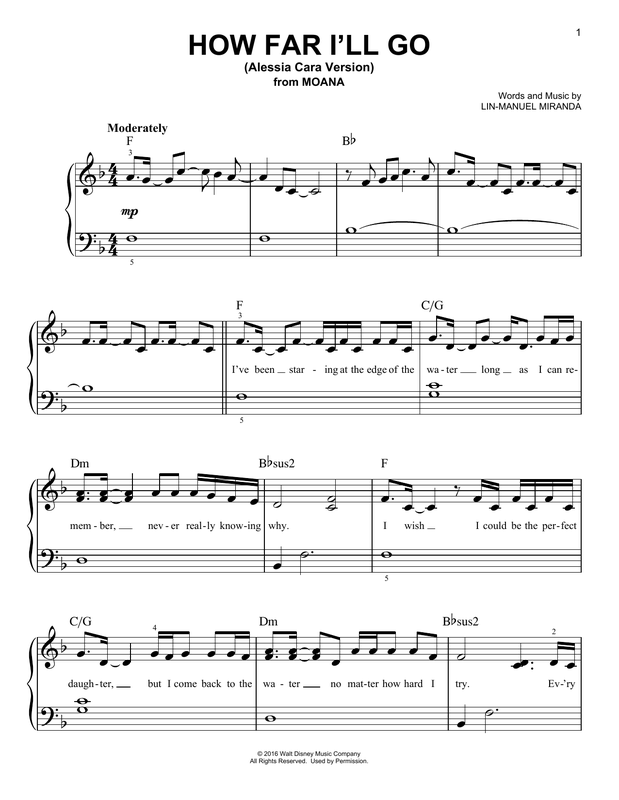 The left hand is simple and supportive, so the arrangement sounds full while being easy to sing and play. Plus, it’s arranged in a comfortable range for higher voices. This can’t be stressed enough. Young voices are often forced into singing in lower keys that are easy for fingers to play. This key works though. A double win! Simple chord symbols are included, so guitar, ukulele, or piano chord improvisation is easier. It’s a nice addition to a piano lesson to have the teacher or another student strum along. This piece in particular, with the Hawaiian element, lends particularly well to having ukulele accompaniment. If you’re looking for an easy piano sheet music arrangement of the mega hit Moana, this is the one! 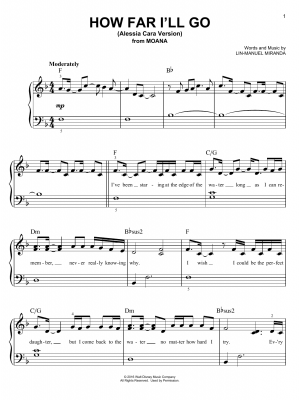 View all Moana sheet music.